So said Reed Hastings, Netflix CEO, during his keynote at this year’s Mobile World Congress when asked what his forecast was for future technologies over the next five to twenty years. This year’s Mobile World Congress (MWC) was full of tech that gets us excited about the future though. From 5G, which could be up to a thousand times faster than 4G, to new real-world VR applications, the event over the years has become so much more than just a showcase for mobile devices. We were able to check it out, and have put together a list of some of the technologies that got us most excited, and that we feel will form a big part of our future lives. As Hervé Lambert, Global Consumer Operations Manager at Panda Security, was quick to point out though, there is a flipside. As he put it, as these new technologies advance, cyber criminals “will become more specialized with each type of attack and will go deeper into the system.” For every new exciting piece of tech, there is of course, the question of cyber security. How will this tech shape our future and will it be one where we can feel safe in the physical and digital world? Driving home the MWC’s futurist appeal, as well as the fact that the event is more than a simple mobile device exhibition, was the amount of robots on display this year. PaPeRo, the human companion robot was demoed by various companies. Its impressive face recognition capabilities can be utilized for public safety, even being able to track lost children in shopping malls. At the Ubuntu stall, meanwhile, REEM and REEM-C were both on display. REEM-C, which was designed by Barcelona-based PAL Robotics, is a flexible full-size humanoid biped robot that is used for different types of research, including AI. Being connected to the Internet of Things (IoT) obviously poses potential risks. REEM-C, for example, weighs 80 kg. In a future where robots are more widely available, a malicious attacker could cause real damage by taking control of such a heavy piece of machinery. AI and big data analysis is actually being used today to make people safer though. During a keynote speech at the MWC, Takashi Niino, CEO and president of the NEC Corporation, described how real-time analysis with face recognition technology is being used in Tigre, Argentina to reduce crime. The highly accurate face recognition technology can be used to identify criminals, and even to detect suspicious behavior. Since the “urban surveillance system” was implemented, vehicle theft has gone down by 80 per cent in Tigre. Virtual reality has been touted for a while as the next big thing in entertainment. We’ll be able to fully immerse ourselves in distant locations and invented realities. Arguably, its close relative, augmented reality (AR), is where the most life-changing innovation is going to take place though. Several new VR/AR applications were on show at the MWC. Relúmĭno –which was on show at Samsung’s C-Lab VR projects stall– demonstrated an impressive practical application for VR. The Relúmĭno app, designed for Samsung’s Gear VR headset, acts as a smart visual aid for visually impaired people by remapping blindspots. The effect, when using the headset, can be described as seeing the world as a cartoon with edges and surfaces in your surroundings rendered as sharp black lines. Other separate standalone projects, like Inflight VR, aim to enhance our inflight experience with VR entertainment. Flight notifications will appear at the bottom of the screen as you navigate the hand-tracking controlled system. LiveRoom, on the other hand, will allow people a more immersive retail experience with its AR capabilities, and can also be used to enhance the classroom experience. What dangers do we face when it comes to VR/AR though? VR and AR can be compared to social media, but on a whole other level. This means that when it comes to online privacy, the stakes will be much higher. An unfortunate example has already been seen of this in real life. Users have reported sexual harassment on VR, with inappropriate gestures by some gamers towards other players. Much like with social media, some users sadly see the anonymity afforded by their digital avatars as allowing them to act inappropriately in the digital world. This type of problem could reverberate beyond just VR gaming though. It’s very likely that our digital avatars will become an even more important part of our lives in VR than they are now in the likes of Twitter and Facebook. If hackers can carry out ransomware attacks after retrieving information on social media, it’s possible that this type of attack will be an even bigger danger with VR in the future. One of the visions of the future presented at the MWC was one of people sitting back on their commute to work, in their driverless cars, as the vehicle safely takes control of everything. Whilst this future may still be in the distance, some cars on display at the MWC are certainly taking us in that direction. Roborace showed off its “robocar” at the even, whilst Peugeot revealed its Instinct concept car, a futuristic and stylish vehicle that wouldn’t look out of place in a sci-fi movie. One of the Instinct’s capabilities is that it can change the ambience inside the vehicle, depending on the passenger’s mood. Stressed out after work? It’ll put you into a relaxed seating position and change the lighting to ‘ambient’. As the car will connect to the IoT using Samsung’s Artik cloud platform, it will be able to seamlessly integrate your vehicle’s operating system with other devices. This could make your car remind you that a drive to the supermarket is in order, for example. Haven’t been keeping up with your fitness regime? Your car could encourage you to stop and jog the rest of your journey. Of course there are potential risks when it comes to this technology. Though the technology doesn’t exist yet, there were many 5G demonstrations at the MWC. Most of these focused on reduced latency speeds, meaning that we’ll have a future where almost anything can be controlled in real-time. Could hackers take control of a vehicle that’s connected to the IoT and take it off course without the passenger realizing? It’s a scary prospect. According to Panda Security’s Hervé Lambert, “online security’s Achilles’ heel is the Internet of Things”. It’s important for cyber security experts to keep up with tech innovations, as there’s no doubt that cyber criminals will too. Lambert says that hackers aren’t the only worry though. It’s a possibility that in the future, “insurance companies could exploit driving data. This could include data about the way people drive and it could be used to increase insurance prices based on new criteria.” Insurers could have access to a huge amount of data, including where people drive and where they park. Third-party data gathering could be taken to a whole new level. The IoT will massively benefit our lives, but sadly, it could also open a door to hackers and companies that are looking to financially exploit its users. There was so much tech on show at this month’s Mobile World Congress that will undoubtedly shape our futures and improve our lives in many ways. Just as autonomous cars look to be brining sci-fi predictions to real life, IIT’s grapheme electrode prosthetic is set to change people’s lives in a way that was previously only imaginable on the big screen. Think Luke Skywalker’s robot hand in The Empire Strikes Back. Graphene, a material that is invisible to the naked eye, will allow electrodes to be embedded comfortably into a robot-like prosthetic hand; a big advance in prostheses. Drones were also a big draw at the MWC. 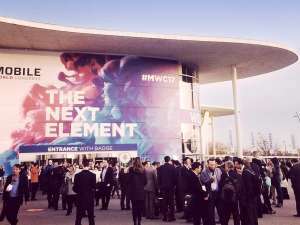 Though they can be used for games as well as to record things from a distance, their most prominently discussed capacity at the MWC was for use in security systems. Whilst the flying machines will allow efficient surveillance, we also face the Orwellian prospect of drone surveillance as a means for law enforcement. Will they keep us safe or be used to control us? Only time will tell. When pushed to give an answer for his forecast of the future, Reed Hastings said, “[at Netflix] we’re not sure if we’ll be entertaining you or AI.” While such advances in artificial intelligence are still a long way away, the Mobile World Congress has shown this year that technology will increasingly become a seamlessly integrated part of our very existence. Though future predictions are largely positive when it comes to new technologies, there’s a negative side that also merits attention. Cyber security is undeniably a big part of the puzzle when it comes to a future of safe, smart, integrated cities. The post Mobile World Congress 2017: Are Future Technologies Safe? appeared first on Panda Security Mediacenter.